Suppose we could find a way to cut health care cost per beneficiary by more than one third AND eliminate the long term deficit. Could we do that? Yep. How? Turn Medicare into a single-payer system open to everyone. Take a look at these two charts. The first chart compares the real cost per beneficiary of private health insurance in the U.S. vs Medicare. 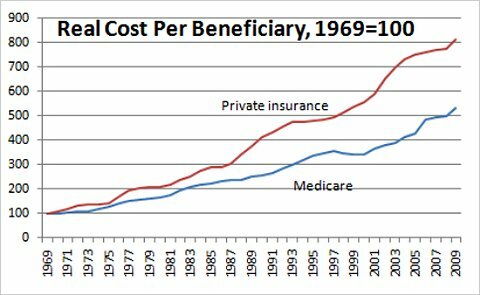 Note, Medicare is a lot cheaper. It has been cheaper since 1970 and keeps getting cheaper. 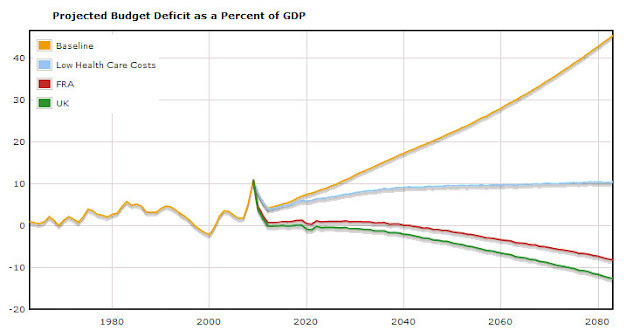 The second chart compares the projected budget deficit as a percent of GDP under baseline projections from the non-partisan Congressional Budget Office (yellow line) to where the deficit would be if health care costs in the U.S. were to rise only due to the aging of the population and stay even with per capita GDP growth (blue line) to what the deficit would be like if we had a single payer system like England (green line) or France (red line) which enjoy longer life expectancies than the U.S. Bottom-line: If we were really serious about eliminating the deficit, we would make Medicare our single-payer system available to every American. If we were really interested in improving health care and extending life expectancy, we would make Medicare our single-payer system available to everyone. We would NOT be talking about the Republican voucher proposal which would only drive up health costs without improving quality of care or life expectancy AND make the deficit WORSE.